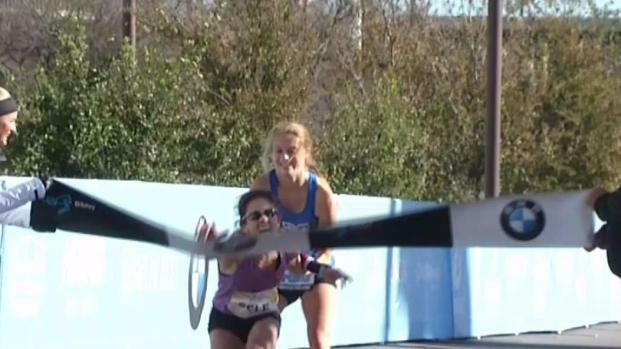 The 2017 BMW Dallas Marathon had an unexpected ending in the women's division with the winner struggling to reach the finish. Chandler Self won the women's division of the marathon with an unofficial time of 2:53:58, but not without help. Self collapsed a few times as she approached the finish line of the race. 17-year-old Ariana Luterman, from Greenhill Academy, was running for the elite high school relay alongside Self and helped her cross the finish line. 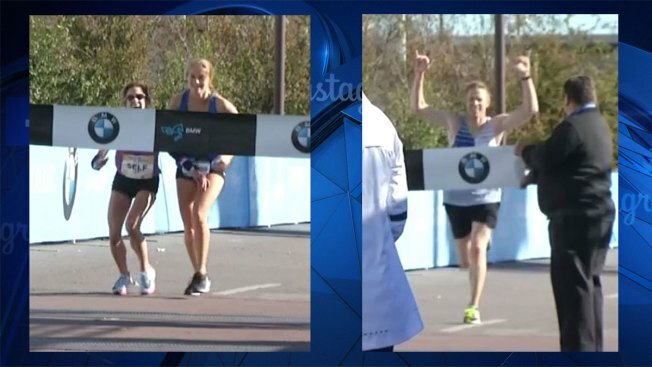 The 2017 BMW Dallas Marathon had an unexpected ending in the women's division with the winner struggling to reach the finish and a repeat winner in the men's division. "Right when I caught up with her at the [relay team's] 2.5-mile mark, I told her: 'Just so you know, the high school relay is out here to compete with you guys. I'm going to be your pacer. We're going to get you that win,'" Luterman said in recalling the the moments before Self started to lose her strength to the Dallas Morning News. "I just couldn't help but think she worked so many months. You can be training years for a marathon," Luterman said in an interview after the race. "As soon as we got to the finish line, I pushed her out in front of me so she could cross the tape before I did." Self ended the race grasping for the finish line and was immediately taken by marathon staff for treatment. Self was treated and came back moments later to give post-race interviews. Self recalled Luterman telling her, "You can do it. You got it, come on girl. The finish line's right there we can see it." "She was so encouraging," Self said. "I knew she was right, and I wanted it so bad and this was just a dream for me." When asked about the heroic finish, Luterman said she's sure Self would've made it across without her. Still, she said she felt lucky that she was placed in the right place at the right time. “More than anything, I think I showed people there are opportunities everywhere. There are opportunities to help everyone everywhere," Luterman said. Helping others has been a driving force in Luterman's life for several years. After competing in her first triathlon at age seven and her first adult triathlon at age 10, Luterman found a way to use her platform as a young elite athlete to benefit others. At just 12, she started Team Ariana to raise money for Vogel Alcove. The Dallas based organization provides free child development services for homeless children. In five years, Team Ariana has raised more than $150,000 for Vogel Alcove and helped several other local charities. Meanwhile, the men's winner is a familiar name, Keith Pierce, who won the 2016 marathon. Pierce is a cross country and track coach at McKinney Boyd High School. He defended his title running the 2017 marathon in an unofficial time of 2:27:17.